The Chalukya dynasty (Kannada: ಚಾಲುಕ್ಯರು IPA: [ʧaːɭukjə]) refers to an Indian royal dynasty that ruled large parts of southern and central India between the sixth and twelfth centuries. During that period, they ruled as three closely related, but individual dynasties. The earliest dynasty, known as the Badami Chalukyas, ruled from their capital Badami from the middle of the sixth century. The Badami Chalukyas began to assert their independence at the decline of the Kadamba kingdom of Banavasi and rapidly rose to prominence during the reign of Pulakesi II. After the death of Pulakesi II, the Eastern Chalukyas became an independent kingdom in the eastern Deccan. They ruled from the capital Vengi until about the eleventh century. In the western Deccan, the rise of the Rashtrakutas in the middle of eighth century eclipsed the Chalukyas of Badami before being revived by their descendants, the Western Chalukyas in late tenth century. Those Western Chalukyas ruled from Basavakalyan till the end of the twelfth century. The rise of the Chalukyas marks an important milestone in the history of South India and a golden age in the history of Karnataka. The political atmosphere in South India shifted from smaller kingdoms to large empires with the rise of Badami Chalukyas. For the first time in history, a South Indian kingdom took control and consolidated the entire region between the Kaveri and the Narmada rivers. The rise of that empire also saw the birth of efficient administration, rise in overseas trade and commerce and the development of new style of architecture called Vesara. Around the ninth century, it also saw the growth of Kannada as a language of literature in the Jaina Puranas, Veerashaiva Vachanas and Brahminical traditions. The eleventh century saw the birth of Telugu literature under the patronage of the Eastern Chalukyas. While opinions vary regarding the early origins of the Chalukyas, the consensus among historians reasons that the founders of the empire had been native to the Karnataka region. According to one theory, the Chalukya descended from the "Seleukia" tribe of Iraq and that their conflict with the Pallava of Kanchi constituted a continuation of the conflict between ancient Seleukia and "Parthians," the proposed ancestors of Pallavas. That theory has been rejected by many scholars as it seeks build lineages based simply on similar sounding clan names. Another theory that they descended from a second century chieftain called Kandachaliki Remmanaka, a feudatory of the Andhra Ikshvaku (from an Ikshvaku inscription of second century) has been put forward but failed to explain the difference in lineage. The Kandachaliki feudatory call themselves Vashisthiputras of the Hiranyakagotra where as Chalukya inscriptions address themselves as Harithiputras of Manavyasagotra, which incidentally matches their early overlords, the Kadambas of Banavasi. That makes them descendants of the Kadambas. The Chalukyas took control of the territory formerly ruled by the Kadambas. Another record of Eastern Chalukyas conforms to the northern origin theory and claims one ruler of Ayodhya came south, defeated the Pallavas and married a Pallava princess. She had a child called Vijayaditya who many claimed became the Pulakesi I's father. Inscriptional evidence supports Ranaranga as the father of Pulakesi I. While the northern origin theory has been dismissed by many historians, suggestions of a southern migration as a distinct possibility deserves examination. The complete absence of any reference to their family connections to Ayodhya in the Badami Chalukya inscriptions and their Kannadiga identity may have been due to their earlier migration into present day Karnataka region where they achieved success as chieftains and kings. Hence, the place of origin of their ancestors may have been without significance to the kings of the Badami Chalukya empire who may have considered themselves natives of the Kannada speaking region. There has been controversy even regarding the caste to which the early Chalukyas belonged. Evidence in the writings of twelfth century Kashmiri poet Bilhana suggests the Chalukya family belonged to the Shudra caste while other sources claim they belonged to the Kshatriya caste. The Chalukya inscriptions had been written in Kannada and Sanskrit. Their inscriptions call them Karnatas and their names use indigenous Kannada titles such as Priyagallam and Noduttagelvom. The names of some Chalukya kings end with the pure Kannada term arasa (meaning "king" or "chief"). 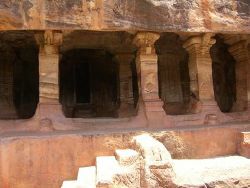 The Rashtrakuta inscriptions speak of Chalukyas of Badami as Karnataka Bala (Power of Karnataka). Scholars have proposed that the word Chalukya originated from Salki or Chalki, a Kannada word for an agricultural implement. Inscriptions constitute the main source of information about the Badami Chalukya history. Important among them, the Badami cave inscriptions (578) of Mangalesa, Kappe Arabhatta record of 700, Peddavaduguru inscription of Pulakesi II, the Kanchi Kailasanatha inscription and Pattadakal Virupaksha Temple inscriptions of Vikramaditya II all in Kannada provide more evidence of the Chalukya language. The earliest inscription of the Badami cliff dated 543 of Pulakesi I, the Mahakuta Pillar inscription (595) of Mangalesa and the Aihole inscription dated 634 of Pulakesi II represent examples of Sanskrit inscriptions written in old Kannada script. The reign of the Chalukyas saw the arrival of Kannada as the predominant language of inscriptions along with Sanskrit, in areas of the Indian peninsula outside, known as Tamilaham (Tamil country). Several coins of the early Chalukyas with Kannada legends have been found indicating usage of Kannada at the highest administrative levels. Inscriptions of the Chalukyas have been translated and recorded by historians of the Archaeological Survey of India. Hiuen-Tsiang, a Chinese traveller had visited the court of Pulakesi II. At the time of that visit, as mentioned in the Aihole record, Pulakesi II had divided his empire into three Maharashtrakas or great provinces comprising of 99,000 villages each. That empire possibly covered present day Karnataka, Maharashtra and coastal Konkan. Hiuen-Tsang, impressed with the governance of the empire observed that the benefits of king's efficient administration extended far and wide. Later, Persian emperor Khosrau II exchanged ambassadors with Pulakesi II. Indra once requested Brahma to create a hero who would put an end to Godlessness in the world and punish the wicked. Agreeing to his request, Brahma looked into his Chuluka (hollow of the hands) while performing the Sandhya, and lo! From there sprang a mighty warrior. He was called "Chalukya" and he became the eponymous ancestor of the line. In it were born two great heroes, Harita and Manavya who raised the Chalukyas into distinct position. This story is repeated and elaborated in the Ramastipundi grant of Vimaladitya of the Eastern Chalukya family. Another legend in the Handarike inscription of Vikramaditya VI claims that the Chalukyas had been born in the interior of the Chuluka (hollow of the palm) of the sage Haritipanchashikhi when he poured out libations to the Gods. The Chalukyas claimed to have been nursed by the Sapta Matrikas (the seven divine mothers); they had a popular practice of linking South Indian royal family lineage to a Northern kingdom in ancient times. According to a Western Chalukya inscription of Vikramaditya VI, the Chalukyas originally hailed from Ayodhya where 59 kings, and later 16 more, of that family ruled from Dakshinapatha (South India) where they had migrated. The Chalukyas ruled over the central Indian plateau of Deccan for over 600 years. During that period, they ruled as three closely related, but individual dynasties. The Chalukyas of Badami, who ruled between the sixth and the eighth century, and the two sibling dynasties of Chalukyas of Kalyani or the Western Chalukyas and the Chalukyas of Vengi or the Eastern Chalukyas. In the sixth century, with the decline of the Gupta dynasty and their immediate successors in northern India, major changes began to happen in the area south of the Vindyas— the Deccan and Tamilaham. The age of small kingdoms had given way to large empires in that region. Pulakesi I established the Chalukya dynasty in 550. Pulakesi I took Vatapi (Badami in Bagalkot district, Karnataka) under his control and made it his capital. 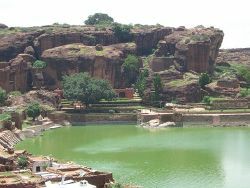 Historians refer to Pulakesi I and his descendants as Chalukyas of Badami. They ruled over an empire that comprised the entire state of Karnataka and most of Andhra Pradesh in the Deccan. Pulakesi II (precoronation name "Ereya") had been perhaps the greatest emperor of the Badami Chalukyas. Also known as Immadi Pulakesi, scholars consider him one of the great kings in Indian history. His queen, Kadamba Devi, had been a princess from the dynasty of Alupas. They maintained close family and marital relationship with the Alupas of South Canara and the Gangas of Talakad. Pulakesi II extended the Chalukya Empire up to the northern extents of the Pallava kingdom and halted the southward march of Harsha by defeating him on the banks of the river Narmada. He then defeated the Vishnukundins in the southeastern Deccan. Pallava Narasimhavarman reversed that victory by attacking and occupying the Chalukya capital Vatapi (Badami) temporarily. The Badami Chalukya dynasty went into a brief decline following the death of Pulakesi II due to internal feuds. It recovered during the reign of Vikramaditya I, who succeeded in pushing the Pallavas out of Badami and restoring order to the empire. The empire reached a peak during the rule of the illustrious Vikramaditya II who defeated the Pallava Nandivarman II and captured Kanchipuram. The Rashtrakuta Dantidurga overthrew the last Badami Chalukya king Kirtivarman I in 753. At their peak they ruled a vast empire stretching from the Kaveri to the Narmada. The Chalukyas revived their fortunes in 973 after over 200 years of dormancy when the Rashtrakutas dominated much of the Deccan. While the popular theory states that the Kalyani Chalukyas belonged to the Badami Chalukya line, objections have been raised by some historians indicating they may have been unrelated to the Early Chalukya family. The Badami Chalukyas had titles like Satyashraya, also the name of a Kalyani Chalukya prince, and that they used titles ending with Yuddamalla, Rajamalla, seen commonly in other Chalukya families of the area. Irrespective of their exact origin, the reign of the Kalyani Chalukyas had been a golden age in Kannada literature. Tailapa II, a Rashtrakuta feudatory ruling from Tardavadi-1000 (Bijapur district) overthrew Karka II and re-established the Chalukyan kingdom and recovered most of the Chalukya empire. That dynasty came to be known as the Western Chalukya dynasty or Later Chalukya dynasty. The Western Chalukyas ruled for another 200 years, engaged in constant conflict with the Cholas and their cousins the Eastern Chalukyas of Vengi. Scholars widely considered Vikramaditya VI the greatest ruler of the dynasty; his 50 year reign called Chalukya Vikrama Era. The Western Chalukyas went into their final dissolution c. 1180 with the rise of the Hoysalas, Kakatiya and Seuna. 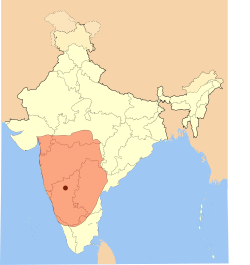 Pulakesi II (608 – 644) conquered the eastern Deccan, corresponding to the coastal districts of Andhra Pradesh in 616, defeating the remnants of the Vishnukundina kingdom. He appointed his brother Kubja Vishnuvardhana as Viceroy. On the death of Pulakesi II, the Vengi Viceroyalty developed into an independent kingdom. Eastern Chalukyas of Vengi outlived the main Vatapi dynasty by many generations. A claim has been made that the Eastern Chalukyas originally descended from Kannada and another that they came from the Maratha Kshatriyas line. Initially they encouraged Kannada language and literature though after a period of time local factors took over and they gave importance to Telugu language. Telugu literature owes its growth to the Eastern Chalukyas. The period of Badami Chalukya dynasty saw art flourish in South India. It brought about some important developments in the realm of culture, particularly in the evolution and proliferation of a new style of architecture known as Vesara, a combination of the South Indian and the North Indian building styles. Sage Bharata's dance Natyasastra entered an advanced state of development. One of the richest traditions in Indian architecture took shape in the Deccan during that time, called Karnata Dravida style as opposed to traditional Dravida style. The Vesara style influenced the Eastern Chalukyas. The Kalyani Chalukyas further refined the Vesara style with an inclination towards Dravidian concepts, especially in the sculptures. They built fine monuments in the Tungabhadra - Krishna river doab in present day Karnataka. The architecture and art that they left behind offers the most enduring legacy of the Chalukya dynasty. More than 150 monuments attributed to the Badami Chalukya, and built between 450 and 700, remain in the Malaprabha basin in Karnataka. The rock-cut temples of Pattadakal, a UNESCO World Heritage Site, Badami and Aihole constitute their most celebrated monuments. That marks the beginning of Chalukya style of architecture and a consolidation of South Indian style. In Aihole, the Durga temple (sixth century), Ladh Khan temple (450), Meguti temple (634), Hucchimalli and Huccappayya temples (fifth century), Badami Cave Temples (600) provide examples of early Chalukyan art. 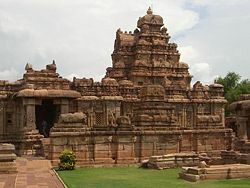 Vikramaditya II (740) commissioned the majestic temples at Pattadakal. Here the Virupaksha and Mallikarjuna (740), Sangameswara (725) and a Jain temple display the Dravidian style while Jambulinga, Kasivisweswara, and Galaganatha (740) show the Northern nagara style. The Papanatha (680) temple shows an attempt to combine the Northern and Southern styles. According to some art critics, the Badami Chalukya style constitutes a "prayaga" or confluence of formal trends of architecture, the dravida and nagara. The temples arose from religious enthusiasm and intensity of purpose. Aihole has become viewed as "one of the cradles of Indian temple architecture"
The rule of the Chalukyas embodies a major event in the history of Kannada and Telugu languages. During that time, writing epic narratives and poetry in Sanskrit proved exceptionally popular. During the ninth - tenth century, Kannada language had already seen some of its greatest writers. The three gems of Kannada literature, Adikavi Pampa, Sri Ponna and Ranna belonged to that period. In the eleventh century, the patronage of the Eastern Chalukyas, with Nannaya Bhatta as its first writer gave birth to Telugu literature. Famous writers in Sanskrit from that period include Vijnaneshwara who achieved fame by writing Mitakshara a book on Hindu law. Somesvara III became a great scholar and king, compiling an encyclopedia of all arts and sciences called Manasollasa. From the period of the Badami Chalukya no major Kannada literary work has been recovered, though many works have been referenced in later centuries. The extant Kappe Arabhatta record of 700 in tripadi (three line) metre represents the earliest work in Kannada poetics. The literary work Karnateshwara Katha, quoted later by Jayakirti, belonged to the period of Pulakesi II with the great king himself as the hero. Other Kannada writers of that time included Syamakundacharya of 650 who wrote Prabhrita, the celebrated Srivaradhadeva also called Tumubuluracharya of 650 (who wrote Chudamani, a commentary on Tattvartha-mahashastra in 96,000 verses), King Durvinita, and others.Scholars consider the Aihole inscription (634) of Pulakesi II, written by court poet Ravi Kirti in old Kannada script and Sanskrit language, an excellent piece of poetry. In Sanskrit, a few verses of a poetess called Vijayanaka has been preserved. The army consisted of infantry, cavalry, elephant corps and a powerful navy. The Chinese traveller Hiuen-Tsiang mentions the Chalukya army had hundreds of elephants intoxicated with liquor prior to battle. They conquered Revatidvipa (Goa) and Puri on east coast of India with their navy. Rashtrakuta inscriptions use the term Karnatabala referring to their powerful armies. The government levied taxes called Herjunka, Kirukula, Bilkode, and Pannaya. The empire divided into Maharashtrakas (provinces), then into smaller Rashtrakas (Mandala), Vishaya (district), Bhoga (group of ten villages) similar to the Dasagrama unit used by the Kadambas. At the lower levels of administration, the Kadamba style fully prevailed. The Sanjan plates of Vikramaditya I even mentions a land unit called Dasagrama. Many autonomous regions existed ruled by feudatories like Alupas, Gangas, Banas, and Sendrakas. Local assemblies looked after local issues. Groups of mahajanas (learned brahmins), looked after agraharas (like Ghatika or place of higher learning) like the ones at Badami (2000 mahajans) and Aihole (500 mahajanas). The Badami Chalukyas minted coins of a different standard compared to the northern kingdoms. The coins had Nagari and Kannada legends. They minted coins with symbols of temples, lion or boar facing right, and the lotus. The coins weighed four grams, called honnu in old Kannada and had fractions such as fana and the quarter fana, whose modern day equivalent being hana (literally means, money). Some record in Pattadakal mentioned a gold coin called Gadyana, later called a varaha, also published on their emblem. The rule of the Badami Chalukya proved a period of religious harmony. They initially followed Vedic Hinduism, as seen in the various temples dedicated to many popular Hindu deities with Aihole as the experimental laboratory. Pattadakal serves as the site of their grandest architecture. The worship of Lajja Gauri, the fertility goddess, had been equally popular. Later, from the time of Vikramaditya I, the people took an inclination towards Shaivism and sects like Pashupata, Kapalikas and Kalamukhas existed. They actively encouraged Jainism, attested to by one of the Badami cave temples and other Jain temples in the Aihole complex. Ravikirti, the court poet of Pulakesi II, had been a Jain. Buddhism had begun a decline, having made its ingress into Southeast Asia, as confirmed by Hiuen-Tsiang. Badami, Aihole and Kurtukoti, Puligere (Laksmeshwara in Gadag district) had emerged as the primary places of learning. The Hindu caste system appeared and the government recognized prostitution. Some kings had concubines (Ganikas) upon whom they bestowed much respect, sati may have been absent as widows like Vinayavathi and Vijayanka are mentioned in records. Devadasis' appeared in temples. Sage Bharata's Natyashastra the precursor to Bharatanatyam, the dance of South India had been popular as seen in many sculptures and mentioned in inscriptions. Women enjoyed political power in administration. Queens Vijayanka, a noted Sanskrit poetess; Kumkumadevi, the younger sister of Vijayaditya; and Lokamahadevi, queen of Vikramaditya II who fought wars, stand as three examples. The Chalukya era may be seen as the beginning in the fusion of cultures of northern and southern India making way for the transmission of ideas between the two regions. That becomes clear from an architectural point of view as the Chalukyas spawned the Vesara style of architecture including elements of the northern nagara and southern dravida styles. The expanding Sanskritic culture mingled in a region where local Dravidian vernaculars had already become popular. Dravidian languages maintain these influences even today. That influence also helped enrich literature in those languages. The Hindu legal system owes much to the Sanskrit work Mitakshara by Vijnaneshwara in the court of Chalukya Vikramaditya VI. Perhaps the greatest work in legal literature, Mitakshara, a commentary on Yajnavalkya, constituted a treatise on law based on earlier writings and has found acceptance in most parts of India. An Englishman Henry Thomas Colebrooke later translated into English the section on inheritance giving it currency in the British Indian court system. During the Chalukya rule, the Bhakti movement gained momentum in south India in the form of Ramanujacharya and Basavanna later spreading to north India. The Government of Karnataka organized a yearly celebration called Chalukya utsava, a three-day festival of music and dance held every year at Pattadakal, Badami and Aihole. The event celebrates the glorious achievements of the Chalukyas in the realms of arts, crafts, music and dance. The Chief Minister of Karnataka inaugurates the program, which starts at Pattadakal and ends in Aihole. Singers, dancers, poets and other artists from all over the country take part in that event. In the February 26, 2006 celebration, 400 art troupes from different parts of the country had taken part. Colorful cut outs of the Varaha the Chalukya emblem, Satyasraya Pulakesi (Pulakesi II), famous sculptural masterpieces like Durga, Mahishasura-mardhini (Durga killing demon Mahishasura) appeared everywhere. The program at Pattadakal has been named Anivaritacharigund vedike after the famous architect of the Virupaksha temple, Gundan Anivaritachari. At Badami they call the program Chalukya Vijayambika Vedike and at Aihole, Ravikirti Vedike after the famous poet and minister in the court of Pulakesi II. RaviKirti authored the Aihole inscription of 634, considered a masterpiece in medieval Sanskrit poetry written in Kannada script. Souvenirs with Sri Vallabha and Satyasraya written on them, available for sale (those represented the titles taken commonly by the kings of the Badami dynasty) along with CDs and DVDs detailing the history and culture of the region. Immadi Pulakeshi, a Kannada movie of the 1960s starring Dr. Rajkumar celebrates the life and times of the great king. ↑ N. Laxminarayana Rao and Dr. S. C. Nandinath have asserted that the Chalukyas had been Kannadigas (Kannada speakers) and undoubtedly the natives of Karnataka, in Suryanath U. Kamath, A Concise History of Karnataka from pre-historic times to the present. (Jupiter books, MCC (Reprinted 2002), 57. ↑ The Chalukyas hailed from present day Karnataka, John Keay, History of India (New York: Grove publications, 2000), 168. ↑ Jayasimha and Ranaraga, the first members of the Chalukya family possibly had been employees of the Kadambas in the northern part of the Kadamba Kingdom - Fleet, "Kanarese Dynasties," 343, in George M. Moraes. (1931), The Kadamba Kula, A History of Ancient and Medieval Karnataka. (New Delhi: Asian Educational Services, 1990. ISBN 8120605950), 51–52. ↑ Pulakesi must have been an administrative official of the northern Kadamba territory centered in Badami- Moraes, 1931/1990, 51–52. ↑ The Chalukya base had been Badami and Aihole from where they overthrew their overlords, the Kadambas, Romila Thapar. The Penguin History of Early India, From Origin to 1300 C.E. (Penguin, 2003), 328. ↑ The Badami region constituted their homeland, - George Michell. Pattadakal - Monumental Legacy. (Oxford University Press, 2002), 5. ↑ Inscriptional evidence proves the Chalukyas native Kannadigas - A. P. Karmarkar. (1947), Cultural history of Karnataka: ancient and medieval. (Dharwad: Karnataka Vidyavardhaka Sangha, OCLC 8221605), 26. ↑ Dr. Lewis' theory has been rejected because the Pallavas had been in constant conflict with the Kadambas, prior to the rise of Chalukyas, Kamath, 2001, 57. ↑ Pulakesi I of Badami, a feudatory of the Kadamba king Krishna Varman II, overpowered his overlord in 540 C.E. and took control of the Kadamba kingdom, Kamath 2001, 35. ↑ Historians, Shafaat Ahmad Khan and S. Krishnasvami Aiyangar have mentioned in their book that Arasa constitutes a Kannada word, equivalent to Sanskrit word Raja. Journal of Indian History p. 102, Published by Department of Modern Indian History, University of Allahabad. ↑ Kamath, 2001, 6, 10, 57, 59, 67. ↑ Ramesh, 1984, 76, 159, 161–162. ↑ Ramesh, 1984, 34, 46, 50. ↑ Coins with Kannada legends have been discovered from the rule of the Chalukyas, according to Kamath, 2001, 12, 57. ↑ A total of 140 important inscriptions in Kannada and Sanskrit have been studied and published by Ramesh, 1984, 177–184. ↑ Pulakesi's Maharashtra extended from Nerbudda (Narmada river) in the north to Tungabhadra in the south-C. V. Vaidya. History of Mediaeval Hindu India (Being a History of India from 600 to 1200 C.E. ), vol II. (Oriental Book Supplying Agency, 1924), 171. ↑ The Eastern Chalukyas concocted a mythical genealogy seeking to carry the antiquity of that royal dynasty not merely to the period of the epics and Vedas but to the moment of their very creation in the heavens by denoting Narayana (Lord Vishnu) as the first of the 59 kings, Ramesh, 1984, 16. ↑ According to scholars, popular theories define the name as Puli-"tiger" in Kannada and Kesin-"haried" in Sanskrit, another theory gives Pole-lustrous in Kannada from his earliest Badami cliff inscription that literally spells Polekesi. Yet another explanation lists Pole- from Tamil word Punai (to tie a knot)-Ramesh, 1984, 31–32. ↑ Dr. S.U. Kamath calls him one of the great kings of India. He successfully defied the expansion of king Harshavardhana of Northern India into the deccan. 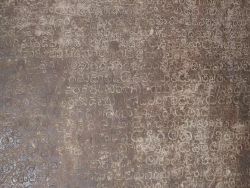 The Aihole inscription by Ravi Kirti describes how king Harsha lost his Harsha or cheerful disposition after his defeat. The Chinese traveller Hiuen Tsiang also confirms Pulakesi's victory over Uttarapathesvara in his travelogue. Pulakesi II took the title Dakshinapatha Prithviswamy, or lord of the south, Kamath, 2001, 58–60. ↑ The reign of Kalyani Chalukya produced prolific literature in Kannada and Sanskrit, Kamath, 2001, 114–115. ↑ Pulakesi II made Vishnuvardhana the Yuvaraja or crown prince who later went on to become the founder of the Eastern Chalukya empire, Nilakanta Sastri, 1955/2002, 134–135, 312. ↑ Adam Hardy. Indian Temple Architecture: Form and Transformation—The Karnata Dravida Tradition 7th to 13th Centuries. (Vedams Books from India, 1995). ↑ Over 125 temples exist in Aihole alone, Michael D. Gunther, Monuments of India. 2002. Retrieved August 25, 2016. ↑ Nilakanta Sastri, 1955/2002, 407-408. ↑ Dr. Jyotsna Kamat, History of Kannada Literature. Kamat's Potpourri. November 04, 2006. Retrieved August 25, 2016. ↑ From Rashtrakuta inscriptions, Kamath, 2001, 57, 65. ↑ In fact the break up of land into mandalas, vishaya also existed in the Kadamba administrative machinery, Kamath, 2001, 36, 65. Bolon, Carol Radcliffe. The Mahākuṭa Pillar and Its Temples. Artibus Asiae Publishers, 1979. Hardy, Adam. Indian Temple Architecture: Form and Transformation—The Karnata Dravida Tradition 7th to 13th Centuries. Vedams Books from India, 1995. ISBN 8170173124. Kamat, Dr. Jyotsna, Chalukyan Art. Kamat's Potpourri, November 04, 2006. Retrieved August 25, 2016. Keay, John. History of India. New York: Grove Publications, 2000. ISBN 0802137970. Khan, Shafaat Ahmad, and S. Krishnasvami Aiyangar, in Arasa. cited in Journal of Indian History Department of Modern Indian History, University of Allahabad: 102. Mahajan, V. D. Ancient India. New Delhi: Chand and Company, (1960), Reprint 2007. ISBN 8121908876. Moraes, George M. The Kadamba Kula, A History of Ancient and Medieval Karnataka. (1931), reprint: New Delhi; Madras: Asian Educational Services, 1990. ISBN 8120605950. Michell, George. Pattadakal - Monumental Legacy. Oxford University Press, New Delhi, 2002. ISBN 0195660579. Narasimhacharya, R. History of Kannada Literature. New Delhi; Madras: Asian Educational Services, 1988. ISBN 8120603036. Nilakanta Sastri, K.A. A History of South India, From Prehistoric times to fall of Vijayanagar. (1955). reprint New Delhi: Oxford Univ. Press, 2002. ISBN 0195606868. Raj, Hans. Advanced history of India: From earliest times to present times, Part 1. New Delhi: Surgeet publications, 2007. Thapar, Dr. Romila. The Penguin History of Early India, From Origin to 1300 C.E. Penguin, 2003. ISBN 0143029894. The Mahakuta Pillar and Its Temples, Carol Radcliffe Bolon, Artibus Asiae publishers, 41 (2/3) (1979): 253–268]. via JSTOR. Aihole Temples, Photographs by Michael D. Gunther, 2002. Badami Cave Temples, Photographs by Michael D. Gunther, 2002. Pattadakal Temples, Photographs by Michael D. Gunther, 2002. Indian inscriptions-South Indian inscriptions, Vol 20, 18, 17, 15, 11 and 9, Archaeological survey of India, What Is India Publishers. APOnline - History of Andhra Pradesh-ancient period-Eastern Chalukyas by Tata Consultancy Services. History of the Kannada Literature, Dr. Jyotsna Kamat. Kamat's Potpourri. Timeless Theater-Karnataka-History of Kannada, November 04, 2006. This page was last modified on 25 January 2017, at 21:41.